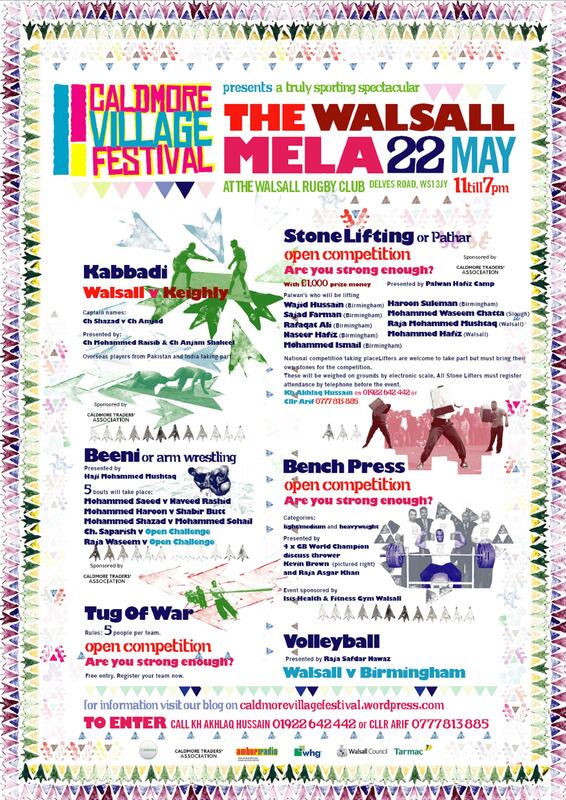 Walsall Mela Poster – Click on this link to check out the fantastic 2011 Mela programme! 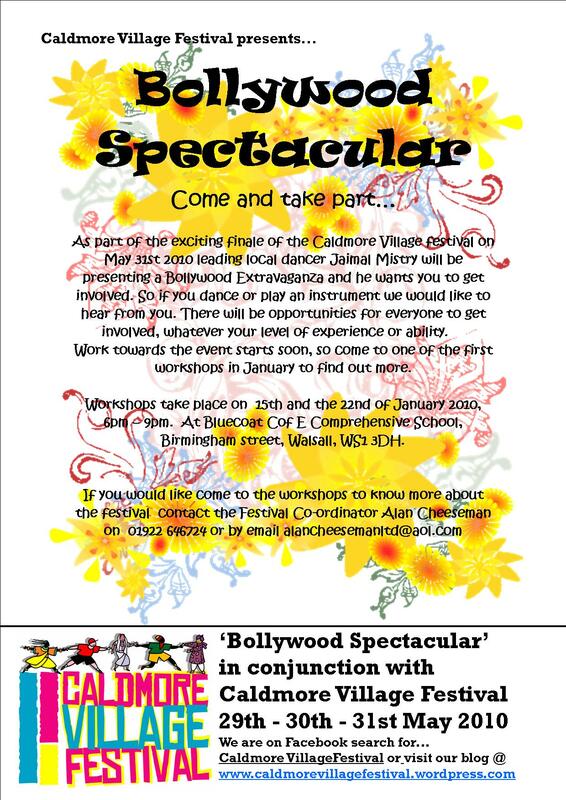 As part of the exciting finale of the Caldmore Village festival on May 31st 2010 leading local dancer Jaimal Mistry will be presenting a Bollywood Extravaganza and he wants you to get involved. So if you dance or play an instrument we would like to hear from you. There will be opportunities for everyone to get involved, whatever your level of experience or ability. Work towards the event starts soon, so come to one of the first workshops in January to find out more. Workshops take place on 15th and the 22nd of January 2010, 6pm – 9pm. At Blue Coat CofE Comprehensive School, Birmingham street, Walsall, WS1 3DH. Can you sing, dance, play an instrument? Are you a poet? Do you enjoy telling jokes, acting, mime or can you do magic tricks? Would you like to be in a choir or band? 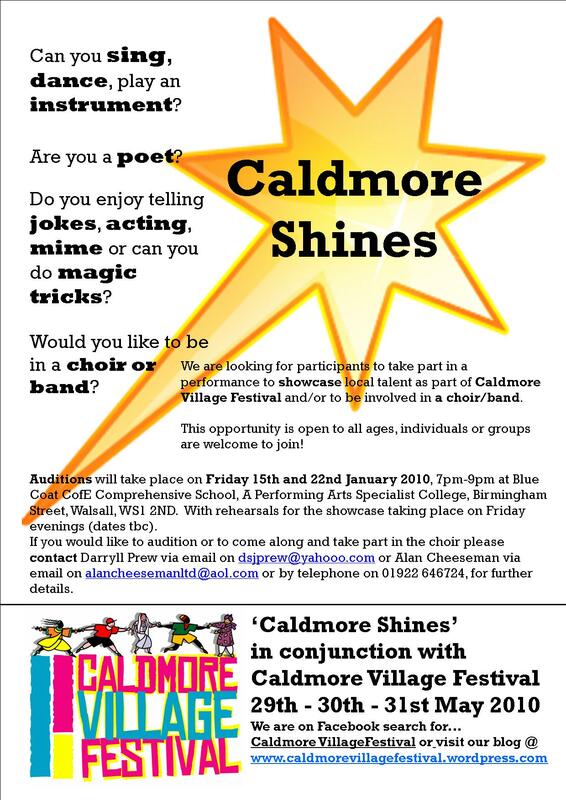 We are looking for participants to take part in a performance to showcase local talent and/or for people to be involved in a choir/band as part of Caldmore Village Festival. This opportunity is open to all ages, individuals or groups are welcome to join! Friday 15th and 22nd January 2010 7pm-9pm @ Blue Coat CofE Comprehensive School, A Performing Arts Specialist College, Birmingham Street, Walsall, WS1 2ND. With rehearsals for the showcase taking place on Friday evenings (dates tbc). If you would like to audition or to come along and take part in the choir please contact Darryll Prew via email on dsjprew@yahooo.com or Alan Cheeseman via email on alancheesemanltd@aol.com or by telephone on 01922 646724, for further details.